In medium bowl, mix flour, 2 tablespoons sugar and the salt. Cut in margarine, using pastry blender or crisscrossing 2 knives, until particles are size of small peas. Add 1/2 cup milk and the egg yolks; mix gently with fork until well blended, adding additional milk, 1 tablespoon at a time, until all flour is moistened and pastry almost cleans side of bowl. Gather pastry into a ball; cut in half. Shape each half into flattened round on lightly floured cloth-covered surface. Roll 1 round into rectangle, 18x13 inches, with floured cloth-covered rolling pin. Fold pastry into fourths; unfold and ease into ungreased jelly roll pan, 15 1/2x10 1/2x1 inch. Stir lemon peel into pie filling. 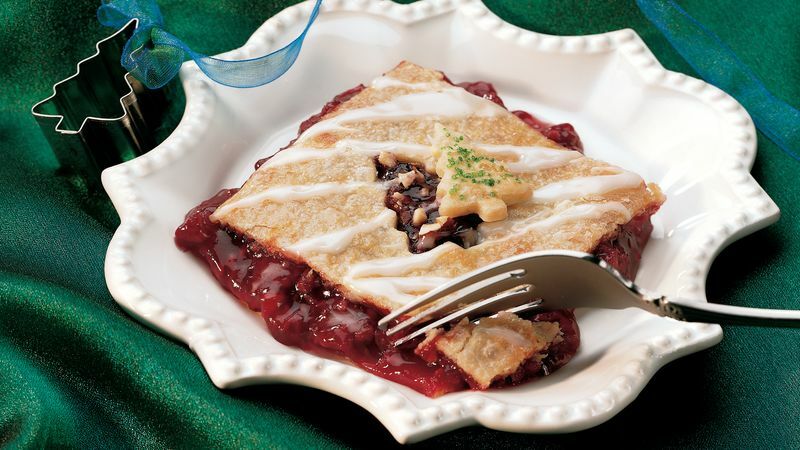 Carefully spoon pie filling over pastry; spread evenly. Sprinkle with hazelnuts. Roll other round of pastry into rectangle, 15 1/2x10 inches. Fold into fourths; cut slits so steam can escape. Place over filling and unfold. Beat reserved egg whites from Pastry recipe and the water; brush over top crust. Sprinkle with 1 tablespoon sugar. Bake pie squares about 1 hour or until golden brown and juice begins to bubble through slits in crust. Cool 1 hour. For servings, cut into 5 rows by 3 rows. Make holiday cutouts in the top crust. Select a 1 1/2-inch cutter in a holiday shape, and cut out 15 designs (one for each serving) in top pastry before folding it into fourths (do not cut slits). Sprinkle cutouts with green sugar before baking. Add a glaze to the partially cooled pie. Mix 1/2 cup powdered sugar and 1 to 2 tablespoons lemon juice. Drizzle glaze over crust.